The past year has seen a bumper crop of new pieces of Personal Protection Equipment (PPE) come onto the market. There have been significant developments in new fabrics, along with new helmets, gloves and boots, so it is a good time to review what is now available to make firefighters and rescue personnel’s lives more comfortable and – above all – safer. HAINSWORTH TECHNOLOGY’s Eco-Dry Shield products have been specifically engineered to combine the unique properties of wool, meta-aramid and Lenzing FR to offer what the company believes is the best solution for wildland and bush firefighters. Due to the special nature of the end use, this fabric has to be fire retardant to extreme radiant and convective heat, while also providing wearers with the best levels of comfort during activity. The single-layer construction provides the user with maximum possible flexibility and mobility over an extended period of time. Eco-Dry Shield provides a reduction in weight, making the product more lightweight for firefighters, without any compromise in protection. It also offers users far greater levels of comfort; a key issue raised by firefighters who have to wear their PPE on the frontline. Harnessing the natural characteristics of wool and Lenzing, Eco-Dry Shield is breathable from skin to the outer meta-aramid surface. Wool’s natural hygroscopic function coupled with Lenzing’s hydrophobic function in the presence of moisture work in combination as a moisture pump and heat regulator. Australian wool provides excellent moisture management and micro-climate control, which works in conjunction with the Lenzing to lock away moisture that cannot evaporate fast enough, increasing the wearer’s comfort. It is also antimicrobial, odour resistant, antistatic and sustainable. Eco-Dry Shield offers good abrasion resistance, pilling, strength, thermal protection and colour fastness, and the excellent thermal protection of wool and meta and para-aramid yarns ensuring no wash out or degrading over time. While Haix says there is nothing is quicker to put on than a slip-on boot it points out that such footwear often sits comparatively loosely on the foot and is unable to compete with lace-up counterparts. 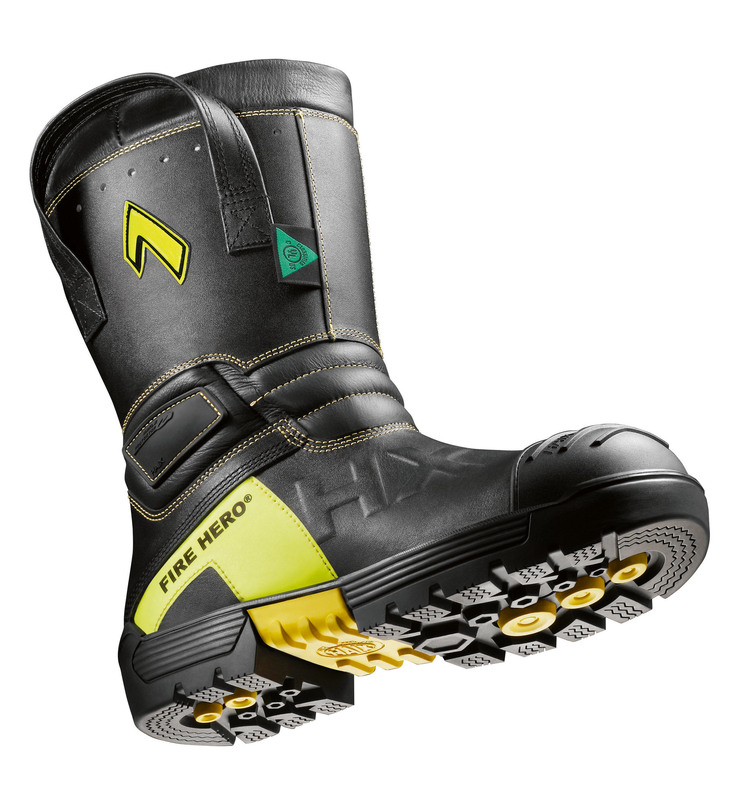 The secret of the new Fire Hero Xtreme lies in the special shoe construction and in the ankle flex system developed by HAIX. These features enable a degree of hold to be achieved that rivals that of a conventional lace-up boot. The ankle flex system enables it to adjust to different foot, ankle, and heel shapes, so providing optimal fit in the boot. When wearers are kneeling down, an integratal bend zone in the instep area and above the heel offers a high level of flexibility when moving either forwards or backwards. 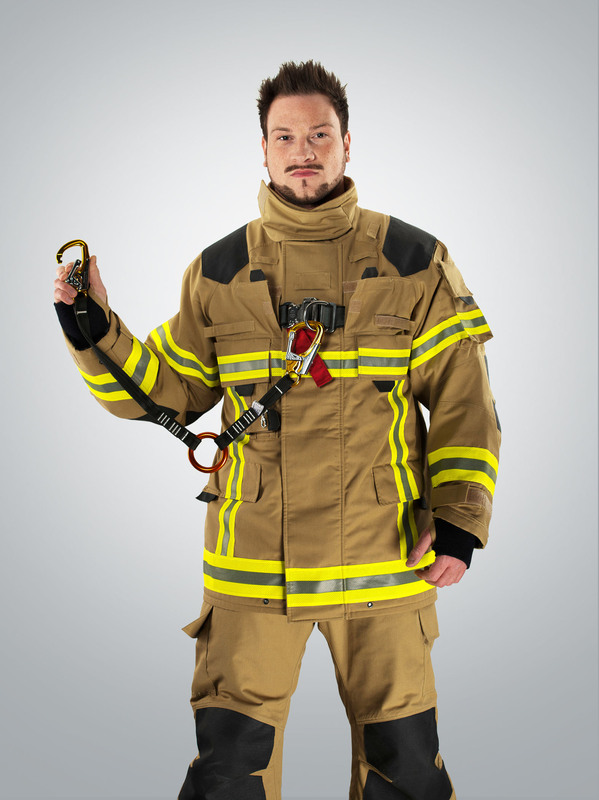 The Fire Hero Xtreme is safe and comfortable and comes fully equipped with all the typical HAIX functionality but without a complicated fastening system. High-quality Crosstech membrane technology is used under the boot’s hydrophobic leather. This provides water resistance and high breathability and is even able to keep out blood and other bodily fluids, so safeguarding wearers against viruses and bacteria and giving enhanced protection against chemicals. Haix Secura liner is a footwear inner liner that will never pull out or wrinkle up over time. The lining is firmly secured and sealed along with the upper leather beneath the sole. An extremely light Composite HX toecap ensures the highest degree of safety in the toe area, while the highly wear-resistant foam rubber shell sole offers a stable non-slipping sole edge for uneven terrain. The honeycomb tread pattern and suction cups offer excellent traction on slippery and wet surfaces. Almost 30 years after the first introduction of the Gallet F1 helmet, MSA is about to introduce its new generation structural fire helmet – the new Gallet F1 XF. It is being heralded by MSA as: “truly the first structural fire helmet designed with firefighters for firefighters” and “bringing firefighter head protection to a new level”. The new Gallet F1 XF offers improved impact protection through increased coverage of the liners and use of modern materials and manufacturing technologies. It also offers enhanced eye and face protection, with superior field of vision and area of coverage, and incorporates a unique dual pivot system for a perfect fit to every face to provide best-in-class comfort. It is available in clear or metal-coated versions, with certified anti-fog and anti-scratch characteristics. The new helmet also delivers superior comfort with perfect balance and fit to the head, with intuitive and robust adjustments for all head sizes and user profiles. It features integrated proximity lighting with multiple LEDs, which enables safer progression in dark or poorly lit environments, and is suitable for use in explosive environment (ATEX approved configuration). A bracket is available for an external lamp. Additionally, the Gallet F1 XF features helmet-mounted headsets, with a selection of microphones (bone conductive or noise cancelling) and single or dual speaker configuration, without any compromise on comfort, plus connection to radio through a push-to-talk (PTT) module. High-performance ear muffs with electronics level dependent attenuation and communication capabilities are also incorporated into the design. Modular design allows for quick and easy inspection and maintenance, reducing dramatically the lifetime cost of ownership over product lifetime. It is available in two sizes to fit all users and customisation options are available including multiple colours, printed or metal badges and stickers to identify rank or function. The new V-Force Max incorporates a new material, TenCate Gemini XTL, which offers tensile strength, flame-retardant properties, a high level of protection against moisture and heat and very low abrasion figures. It is lightweight, flexible and breathable, and the outer fabric is combined with the Gore-Tex Membrane Airlock 3L. Airlock spacer technology ensures heat protection yet allows for a very low level of heat stress. It is based on the thermal protective effect of a layer of air which is formed between two layers of fabric. Hence, the weight of the garment is reduced by up to 50 percent. As a result of the three-layer construction an additional inner lining within the suit is redundant. The new rescue system of the LHD Group is also incorporated in the V-Force Max. This consists of a certified combination of a rescue loop as specified in EN 1498:2006 Class A and a restraining belt in accordance with EN358:1999, providing both a retaining function to prevent falls and a rescue loop for emergency action. The system is completed with a connecting feature that is certified in accordance with EN795:2012 Class B. The belt is closed only when it is needed so that other clothing functions, for example, the panic zipper, can still be used to its full extent. The new Lion protective suit for firefighters incorporates a unique, flame-retardant outer fabric. This material consists, for the main part, of Lenzing FR fibers and is extremely comfortable and breathable. The integrated flame protection cannot be removed by cleaning and scrubbing and protects the wearer from fire, radiant heat, electric arcs, molten metal splash and flammable liquids. The relatively light assembly is suitable for incorporation in ergonomically-designed protective suits with a high level of freedom of movement. The use of water vapor permeable, perforated reflective strips also supports the high level of breathability. The new single layer wildland protective suit with Tecasafe outer fabric provides protection against flames and electric arcs, and is also comfortable to wear. Due to its moisture control properties, the fabric dries quickly and provides a high level of breathability. The Tecasafe fibers retain their intensity of color even after numerous industrial cleaning sessions. It is available in bright yellow or orange. According to ARMADILLO MERINO, next-to-skin clothing is an essential but often overlooked component of an effective layering system and by selecting the correct fabric you can significantly improve the protection, performance and comfort of the wearer. So, the Monty shirt – a recent addition to the next-to-skin PPE offering from Armadillo Merino – is a mock-turtle, long sleeve shirt that is constructed from a high performance jersey knit merino fabric using superfine 17.5μ merino wool. 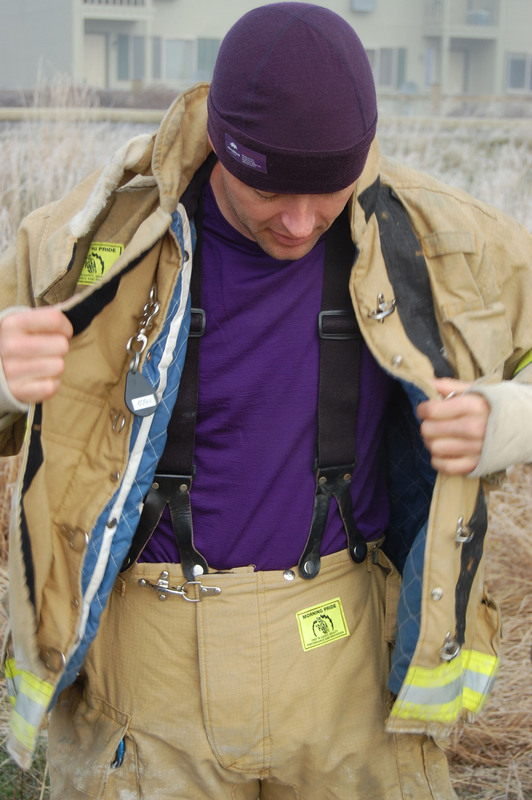 The Monty uses a fabric that offers no-melt, no-drip protection against the skin with the natural FR properties of wool, which can be effective against ignition up to 600 degrees C. The garment also protects against static discharge and UV light and can be used by wildland firefighters looking for a lighter weight, more versatile ensemble combining FR and sun protection. The knit structure of the Monty is effective in managing heat build-up and actively manages moisture, absorbing sweat as a vapour and then as a liquid on reaching perspiration point. The fabric has the ability to hold up to 35 percent of its weight as moisture without feeling wet and by actively moving the moisture away from the skin it greatly increases user comfort. The Monty can be worn for hours or even days without odour build-up, which is great in team environments or for during multi-day events. The Monty can also delay the onset of sweating and amount of sweat generated, which can help in optimising a wearer’s performance and recovery rate by reducing their moisture loss and calorie burn. User comfort features include removing internal labels, raglan sleeves and a long back with the use of a single panel running under the arm from the wrist to the waist removing annoying seams. New Generation Technical Rescue PPE. BRISTOL’s RescueFlex is the company’s latest generation of technical rescue PPE. Built on the XFlex platform, originally introduced for the company’s latest structural PPE, the garments incorporate the three-dimensional design features that provide enhanced limb movement through the use of vented gussets, extra pleats and additional padding at key contact points. The PPE conforms to European and International standard EN ISO 11612 General Flame, is available in a range of male and female sizes and a range of colours – most frequently seen in the orange and high-viz orange associated with international rescue. A Gore Crosstech SR moisture barrier is used in combination with a choice of outer layers including Nomex Delta C, Kermel and Protex cotton. Unlike three-layer structural firefighting PPE, USAR kit is not required to have a thermal barrier allowing a two-layered construction to provide the physical protection for rescue teams working in confined spaces among debris. In particular, protection is required against flame and water ingress, exposure to blood borne pathogens and hydrocarbons as well as the hazards of abrasion, puncture and tearing from sheared metal, timber and rubble. The coat and trouser combination features a special zip fastening that securely connects the jacket to the trousers to maintain the integrity of the ensemble under difficult entry and search conditions. BRISTOL has supplied firefighter PPE to meet NFPA standards for many years and has taken the opportunity of the latest 2013 revision, which came into effect in August last year, to introduce two new NFPA ensembles based on both their Ergotech Action and XFlex designs. The NFPA XFlex design is the main change in response to the new standard, as it has provided Bristol with the opportunity to add two completely new models to the NFPA range. 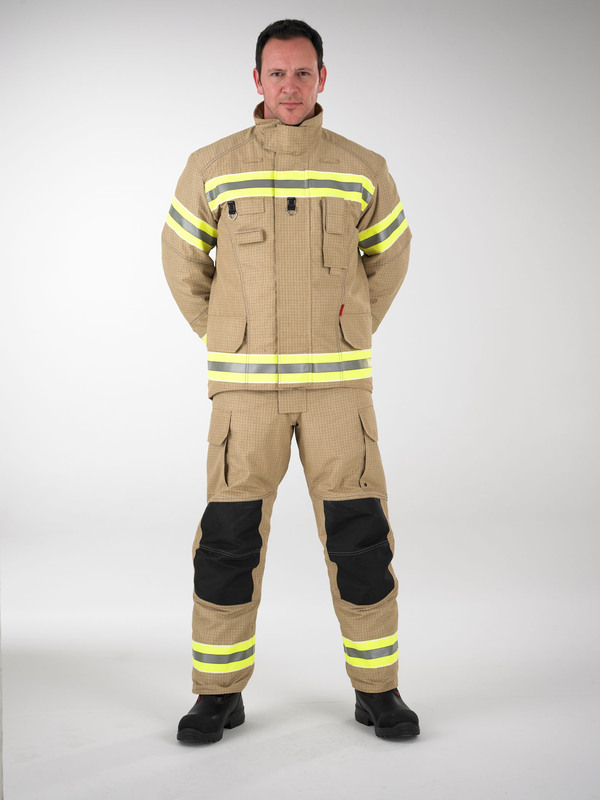 While the original American style NFPA kit based on the Ergotech design has been modified to meet the new requirements, the XFlex models have allowed the introduction of PBI Matrix and Nomex Hainsworth Titan 1220 outer shell options, which both provide the benefits of greater comfort and flexibility. Both incorporate a Gore Crosstech moisture barrier. As well as the use of underarm gussets and fully articulated three-dimensional ergonomic elbow and knee shaping to allow for enhanced body movement, the coat comes complete with Bristol’s drag rescue device. 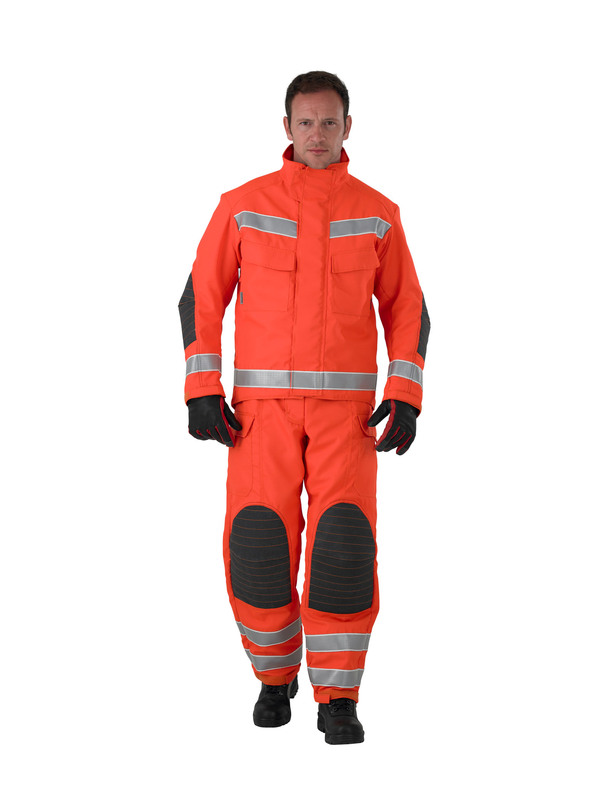 Curved hem at front and back of the coat and on sleeves improve fit and compatibility with other garments such as gloves and boots and when wearing breathing apparatus. Head-to-toe PPE modifications have also been included. 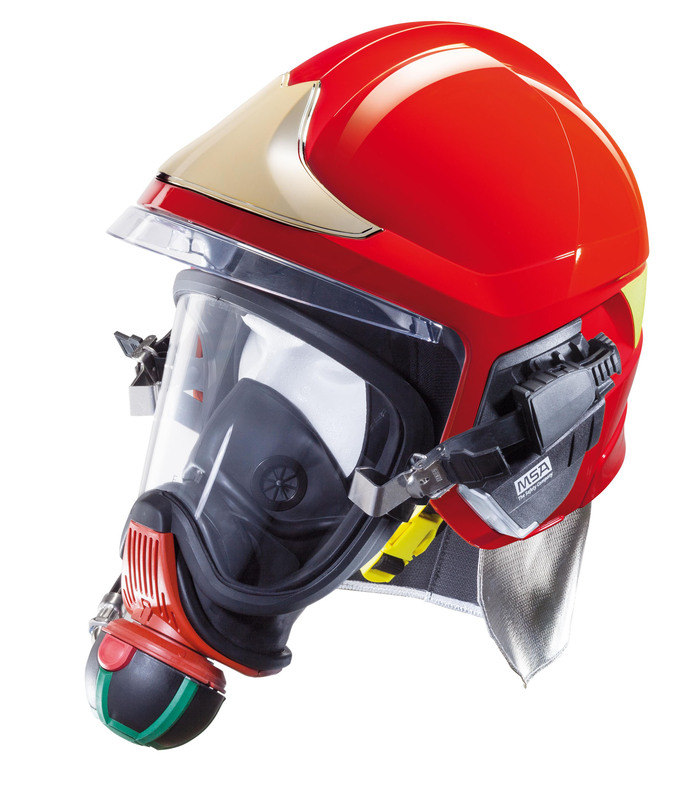 For fire helmets, the design of helmet face shields or goggles must now meet ANSI Z87.1, the standard covering general requirements for eye and face protection, and fire hoods where vented crowns are being eliminated. For gloves and footwear new testing methods have been introduced. There is also a new slip-resistance test that is more realistic in assessing sole and heel traction and changes to the measurement methods for footwear flammability and sole heat penetration.